Bet-at-Home was founded back in 1999, with their online betting sites offering customers sports, casino and poker opportunities. It is their sportsbook that has perhaps achieved the greatest level of success to date, helped by major sponsorship deals with German Bundesliga football teams, Hertha Berlin and Schalke 04. Our Bet-at-Home review will take a detailed look at their entire sportsbook operation, providing readers with a much clearer understanding of their features and services. However, let’s take a more detailed look at their history and achievements to date. Bet-at-Home is an Austrian bookmaker who cater for both sports, casino and poker customers through their different platforms, with their range of markets, competitive odds and mobile capability helping to attract a large number of sports betting punters. Bet-at-Home is now based in Malta, holding valid gambling licenses from both the Malta Gaming Authority and UK Gambling Commission, receiving the latter in 2014. The company was founded by Jochen Dickinger and Franz Omer in 1999, before being listed on the Frankfurt Stock Exchange just five years later. Unlike other bookmakers within the industry, Bet-at-Home choses to operate under their own name, rather than a holding company. Bet-at-Home is believed to have amassed a customer base of over 4 million during its time, however it is uncertain as to what percentage of this figure are still active on their betting platforms. Our Bet-at-Home review will provide readers with a much clearer understanding of their operation, with everything from their range of promotions and sports markets to customer service and additional features discussed. However, let’s first take a look at the pros and cons of Bet-at-Home. Our Bet-at-Home review found that the bookmaker currently offers over 25 different sports markets, with only their lack of horse racing and greyhounds likely to disappoint customers. 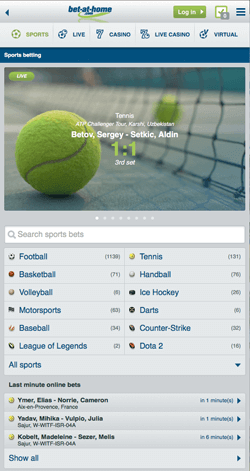 As with many European betting platforms, sports such as football and tennis feature on a daily basis, while E-Sports events are also on offer regularly, whether it be League of Legends, Dota 2 or Counter-Strike. As well as this, Bet-at-Home caters for those with interests away from sports, whether it be from their politics or society markets. In total, the following markets are currently available at Bet-at-Home: Football, Basketball, Tennis, Aussie Rules, Badminton, Baseball, Boxing, Ice Hockey and many more. 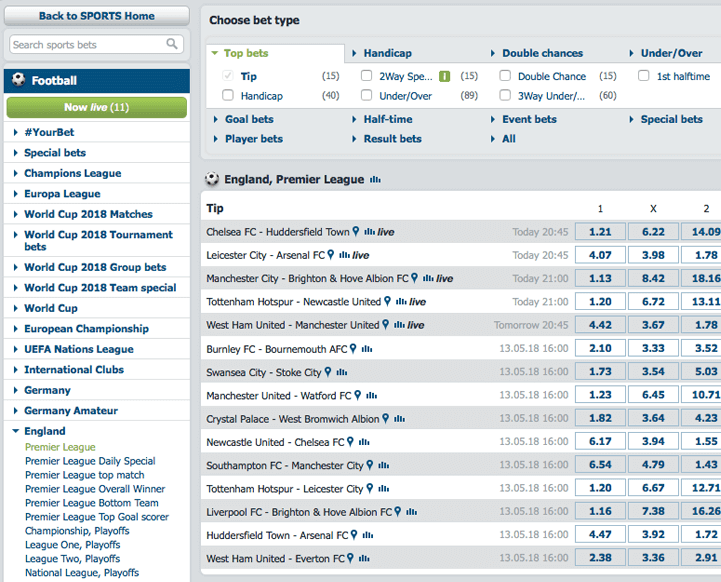 As well as a wide range of markets, Bet-at-Home also perform well in terms of the odds offered to customers. Despite being behind some of their more successful competitors in this area, sports such as football and tennis are still set to appeal to many on their sportsbook, with overround sitting at around 106%. For customers, the lower the overround, the better your potential earnings are likely to be. As a result, it appears that Bet-at-Home price events in order to ensure that they have a strong cushion, no matter what the eventual result is. Perhaps the most striking factor surrounding Bet-at-Home’s operation is its old-fashioned website, which despite being relatively easy to use, is in need of major renovation. It has become increasingly important to provide customers with a visually-pleasing design as well as clever interface, with Bet-at-Home unfortunately having put little effort into this area of their platform. As with many bookmakers, all sports markets are listed down the left-hand side of the page, while customers can also easily move between in-play, casino and poker pages thanks to links found at the top of the page. As well as this, a search engine is on hand to enable users an easy method of locating markets involving their favourite teams and players. Meanwhile, popular features such as news, customer service and 1-click betting are accessible in just a matter of seconds, along with promotions. Elsewhere, the bookmaker provide customers with a results service, as well as statistics surrounding current and upcoming events, perfect for those who like to fully research their selections before staking cash. The Bet-at-Home website states that a sports betting app is “Coming Soon”, however until this has been released, customers can still place bets using their mobile device thanks to their mobile-friendly site. Whether you are an iOS, Android or Windows user, all Bet-at-Home services and features are available here too, with the ‘Last Minute Bets’ feature perfect for those short of time. However, Bet-at-Home’s mobile site is not without error, with its speed and response times meaning that it can often be a frustrating platform. The lack of horse racing markets is perhaps the first thing that customers will notice upon entering the Bet-at-Home sportsbook, which has long been one of the most traditionally popular betting markets. Failing to provide such markets is likely to mean that the bookmaker misses out on significant earnings on a daily basis, as well as losing customers to their rivals. Virtual horse racing and greyhounds markets are unlikely to make up for this, even though odds in this area are appealing. Meanwhile, Bet-at-Home do perform well in terms of their coverage when it comes to football and tennis, with the English Premier League, UEFA Champions League and international clashes offering a large number of betting opportunities. As well as this, a large number of less popular competitions are covered, whether it be action from the Ukrainian top-flight or African leagues. For major football matches, around 40-60 markets are available, which is still short when compared to some of their competitors. Live betting is also available at Bet-at-Home, with football, tennis and basketball among the sports found on a daily basis in this area. Around 100 events are available each day in total, with E-Sports matches becoming increasingly common also. A live betting calendar is on hand to help customers plan their wagering, with odds on in-play markets being updated on a regular basis, based on the score line and ongoing events within a particular clash. Unfortunately, Bet-at-Home do not currently offer any live-streaming options, which perhaps comes as little surprise given the ‘less is more’ theme of their sportsbook. As a result, this is something that customers at Bet-at-Home are unlikely to be able to enjoy anytime soon. Customers registering a new account at Bet-at-Home are able to take advantage of a generous welcome offer with the bookmaker, meaning that they can effectively double their opening account balance by placing a qualifying bet. In order to take advantage of this offer, simply deposit at least £10 after signing up with the bookmaker, with Bet-at-Home providing a free £10 betting voucher to those that comply with the terms and conditions. The bonus funds must be rolled over a minimum of three times, at odds of 1/2, before any withdrawals can be made, with customers having 90 days in which to fulfill these requirements. Finally, bonus funds are only available to use on the Bet-at-Home sportsbook, whether it be a pre-match or in-play bet. There is a separate welcome bonus on offer to their casino customers. A lack of any loyalty scheme or points system comes as a disappointment, with customers enjoying nothing better than receiving a free bet or bonus funds as a result of their consistent wagering. This is another area in which Bet-at-Home should look to make improvements in the future. Deposit Methods Include: Visa, Mastercard, Diners Club, Dotpay, Skrill, giropay, PayPal, SOFORT, Bank Transfer, paysafecard, Neteller, iDeal, Western Union. Bet-at-Home also cater well for customers when it comes to customer service, with a number of features in place for punters to utilise. Customers can communicate with friendly support agents via telephone and email, as well as an efficient live-chat feature. Despite not being available 24/7, good response times mean that customers are rarely left frustrated in receiving assistance. Given the fact that Bet-at-Home are one of the more old-fashioned bookmakers around, it comes as little surprise that their social media presence is minimal, meaning that customers are unable to contact them via Twitter or Facebook. Customer service features at Bet-at-Home are available from 08:00 to 23:59. 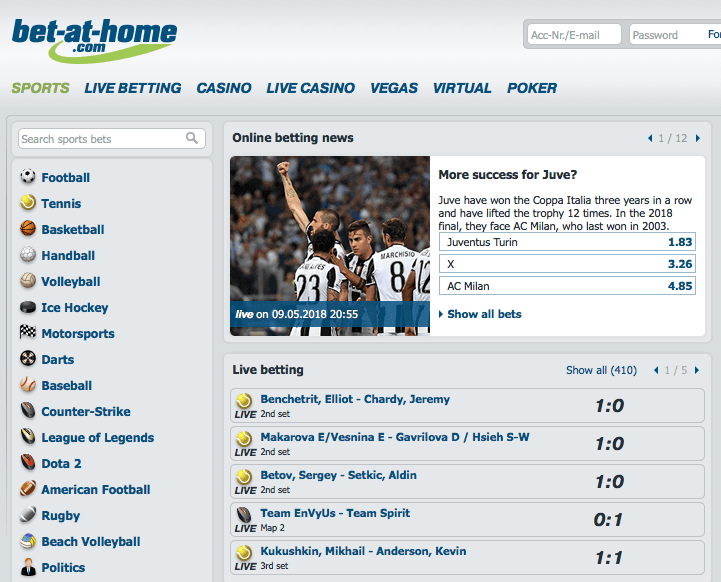 Despite not offering a large amount of information to customers regarding their security measures, Bet-at-Home is undoubtedly a trustworthy betting platform, with the bookmaker taking advantage of an industry grade SSL encryption to ensure that all customer details are kept safe, as well as all transactions being processed securely. However, it would be nice to have some more information surrounding their protocol in this area. Despite our review having demonstrated a number of drawbacks surrounding Bet-at-Home’s operation, there are also plenty of advantages when it comes to their sportsbook. Firstly, they are a platform well worth considering for both football and tennis fans, with their coverage surrounding such sports allowing Bet-at-Home to compete with some of the biggest names in the industry. As well as this, their range of sports markets is improving all of the time, with their E-Sports offerings helping them to stand out from the crowd. In terms of customer service, the fact that the bookmaker offer support in a variety of languages is certainly a pleasing factor, while speedy response times mean that customers can concentrate on placing winning bets, rather than worrying about issues surrounding their account. These factors, coupled with the large number of banking methods on their site, mean that Bet-at-Home is a viable option for most customers. Due to the nature of the betting industry today, it comes as little surprise that Bet-at-Home now struggle to attract new customers on a regular basis. 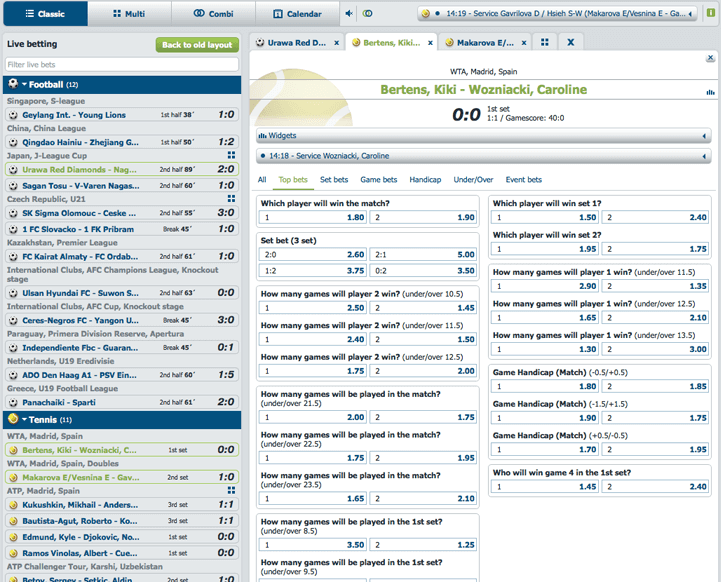 Their sportsbook is outdated and ugly, which for many, does not make up for their range of markets and sports coverage. However, Bet-at-Home have made improvements to their site in terms of the number of markets available, with increasingly popular E-Sports events available on a regular basis. Bet-at-Home have almost two decades worth of experience in the industry, however unfortunately, there are some key features missing from their platform, which again means that they score poorly overall. The inability to live stream sporting events and cash out bets will come as a disappointment to many, while a lack of horse racing markets is another reason as to why potential customers will head elsewhere. A decent welcome bonus is on hand to help attract customers, however a lack of promotions or loyalty scheme for ongoing customers is disappointing. Meanwhile, users can also bet on the go thanks to their mobile-friendly site, with a betting app reportedly in the offing. It is clear that Bet-at-Home are never going to be able to compete with some of the major European bookmakers, however given their experience, they are likely to attract a decent level of customers in the future, with a small number of improvements making them stand out from the crowd even more. Keep an eye on Bet-at-Home in the future to see just what happens.